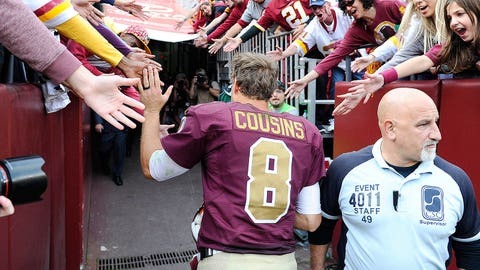 Redskins quarterback Kirk Cousins (8) celebrates with fans after his team's big 31-30 Week 7 win over the Buccaneers. Washington Redskins quarterback Kirk Cousins had gone two games in a row with at least one interception thrown and four in total, but in Week 7, he snapped that streak in the team’s 31-30 win over the Tampa Bay Buccaneers. Cousins was efficient and impressive — he went 33 of 40 with 317 yards passing and three touchdowns. His final six-yard touchdown pass came on an 80-yard game-winning drive that he engineered mostly via the passing game. Talk of benching Cousins for Colt McCoy intensified leading up to the game, but it’s safe to say that we won’t be hearing from those same people in the coming week. Head coach Jay Gruden has stayed true in sticking with Cousins as his starter, and he looked very wise for that decision in Week 7.